William the Conqueror made Simon de St. Liz the first Norman Earl of Northampton, and he is now well known in the town for building the Castle. It is more than likely there was some sort of Saxon or Danish fortification in place on the site prior to the building of the Castle. In addition to the Castle, St Liz built St. Andrew’s Priory, many parts of early Norman Northampton, and, after the first Crusade in 1099, the Church of the Holy Sepulchre in Sheep Street. It is probably when St. Liz died that the Castle passed into the hands of King Henry I, who had previously held an important meeting at the Castle in 1106. 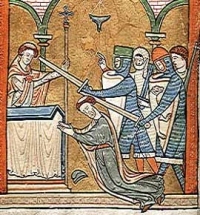 The most famous event to occur at the Castle is surely the trial of Saint Thomas Becket, the Archbishop of Canterbury, which occurred in 1164 and was held by Henry I’s grandson Henry II and a Grand Council of Barons. Becket himself probably lodged at nearby St. Andrew’s Priory and would certainly have visited St. Peter’s church too. His escape towards France under the cover of darkness is well known as is his subsequent murder at Canterbury Cathedral in 1170. Another important historical figure associated with the Castle is King John (1199-1216) who spent all the feast days (Christmas, Easter and Whitsun) at Northampton and is known to have visited the Castle on no less than 30 occasions. Indeed he thought so much of Northampton that he moved the Royal Treasury to the Castle in 1205. The struggles against the Barons took place here in several Great Councils, leading to the Magna Carta in 1215. 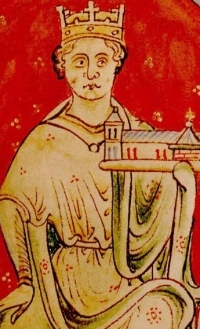 King John’s son, Henry III (1216-72), became king aged 9. Though seen as weak and dominated by his wife’s relations, he undertook many great building projects, including major works at Northampton Castle from 1248. So great was the disruption during the improvements that it became inconvenient to hold the great tournaments until the work was almost completed in 1265-6. In this year, Henry again stayed at Northampton where he continued his almsgiving of shoes to the poor, which he began in 1229: 250 pairs were supplied. Henry’s reign is noted for the rebellion of the barons led by Simon de Montfort, who seized Northampton in 1264, and lost it again. 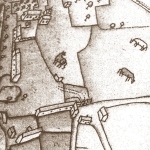 Simon was finally defeated and slain at the Battle of Evesham in August 1265. This was disruptive time and Henry was enraged at the behaviour of the University students here, and forced their return to Oxford decreeing that ‘no scholars (are) permitted to reside in Northampton’. Edward I, II & III continued to hold parliaments and tournaments at Northampton Castle. There were also occasional repairs until 1342 when the Castle began to be used as a gaol.